Sarah Peroutka Studio: "Roses in a Blue Vase" and Drawing for a Painting! "Roses in a Blue Vase" and Drawing for a Painting! This blog has two main purposes: (1) keep me accountable for being productive; and (2) sell my art. To sell my art I have to get people to look at it. Some will look and say "Meh." Others will look and say, "Hmm, interesting but I don't see anything I like." And some will look and say, "I love it and want to enjoy it in my home!" The common denominator is looking. So, in an effort to get more people to look, I want to increase subscriptions to this blog AND increase my number of "Followers." I'm no blog expert by any means, but apparently these are separate things. If someone signs up to receive an email notice when I post to my blog that's great but I don't know who those people are. (There has to be some way of knowing and if you know how, please tell me.) On the other hand, if someone signs up to "follow" my blog I can see their icon and name (unless they sign up to follow privately in which case, once again, I wouldn't know who they are.) So.... to increase my list of followers I'm having another "Drawing for a Painting." On June 30 I'll put the names of my followers into a hat (or other container) and my grandson will pull one out. That lucky person will get a $70 credit toward purchasing my art. Since some of my smaller works sell for $35 to $50, the winner will end up with at least one painting. And here's an additional bonus: For every new follower you send me, I'll your name in the hat an additional time. (Please be fair and only send people who actually like art and will look at my blog!) Just be sure to let me know who you sent so I can give you credit. Note: I really like followers who are fellow artists who can help mentor me in my practice. 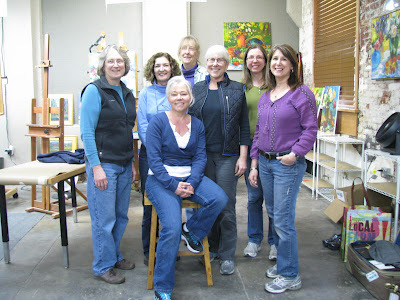 My goals for the month of June: (1) produce 15 new paintings; (2) find three exhibits to participate in this summer and produce the art required; (3) go outside and paint "en plein air" at least four times; and (4) create four new blog posts. 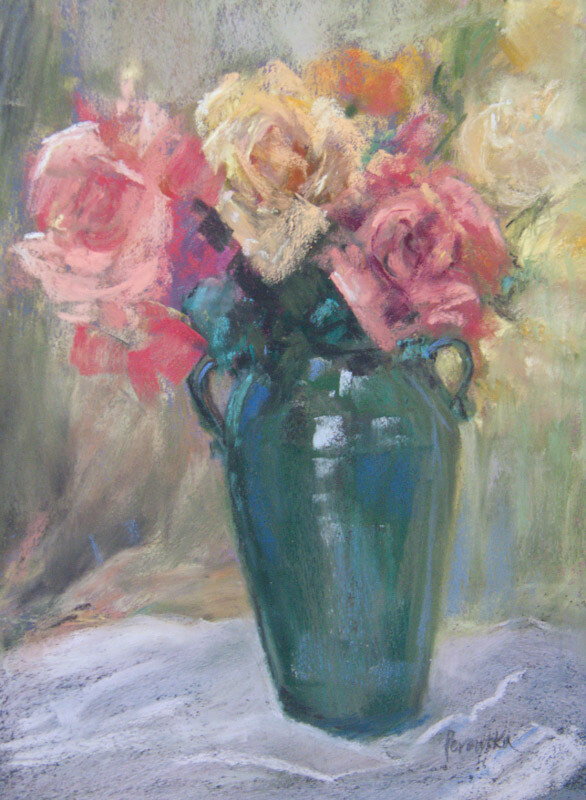 "Roses in a Blue Vase" was produced at Brenda Boylan's Pastel Punch workshop last month. It was a really good experience and I met some very nice artists.